Everyone loves two at a time, right? 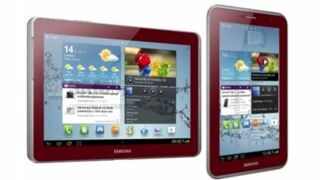 The sound of Samsung Galaxy Tab 3 speculation is reaching a cacophonous state and the latest leak claims to have the specs for two tablets destined for the new range. Details turned up on Greek site Techblog which reckons it has exclusive information of the next slates to come out of the Korean firm, reporting that 8-inch and 10.1-inch models are on the way. According to the leaked specs, the Samsung Galaxy Tab 3 8 will sport an 8-inch 1280 x 800 display, 1.5GHz dual-core processor, 2GB of RAM, 3MP rear camera, 1.3MP front camera, 4500mAh battery and run Android Jelly Bean. It will apparently measure a svelte 209.6 x 112.1 x 6.95 mm - smaller than the 7.9-inch iPad mini - and weigh in at a tidy 330g, slightly heavier than its Apple counterpart. Over in the 10.1-inch Samsung Galaxy Tab 3 court, the larger tablet is said to pack a screen with the same resolution plus the same processor, cameras and operating system as its 8-inch brother. RAM will apparently be dropped to 1GB, while battery is boosted to 7000mAh in the 10.1-inch version. In terms of dimensions this edition is set to be smaller and lighter than the 9.7-inch iPad 4 - which we find hard to believe - with the leaked specs endowing the 10.1-inch Samsung with a 256.7 x 175.3 x 8.7 mm and 533g body. If the leak is correct you'll be able to pick both tablets up in 3G and 4G variants, with the 3G models going on sale in May, while the superfast LTE versions will arrive in June/July.